Alex Descoteaux submitted this photo and caption. In this photo: Thomas Claesen, Alex Descoteaux, Demphy Baert. We were all members of the Academy this past summer, I marched next to Thomas on the tenor line, and Demphy was in the guard. They both are from Belgium and I live in Texas, so I thought I may never see them again. 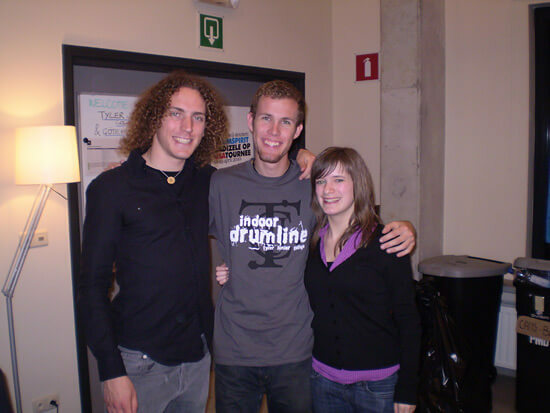 However, when I joined the Tyler Junior College Indoor Drumline, I found out we were going to perform in Europe and would be staying at the DrumSpirit Clubhouse in Belgium, where Thomas and Demphy both teach. It was a great and unexpected reunion!